I’m a big fine woman. I’ve got meat shakin’ on the bone. A skinny woman loses her home. I braved the really cool San Francisco summer weather on Sunday to attend the Fillmore Street Jazz Festival. There were plenty of street vendors, food, and good music along the 12-block stretch of the festival. The highlight of the festival for me was seeing Brenda Boykin bringing us her jazz, blues, and whole lot of soul. The lyrics above came from closing song, “Big Fine Woman.” I definitely look forward to seeing her again in a warmer venue soon. This entry was posted on Tuesday, July 8th, 2003 at 6:21 am. 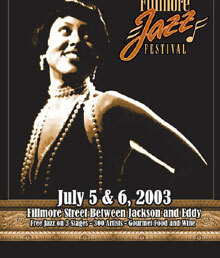 It is filed under Concert Reviews, Fillmore Jazz Festival and tagged with Brenda Boykin, Fillmore District, Fillmore Jazz Festival, Fillmore Street, San Francisco. You can follow any responses to this entry through the RSS 2.0 feed. You just gotta love the line from that song! Thanks again for starting my day with a smile!! i want the lyrics to that song blown up and made into a poster for my wall!